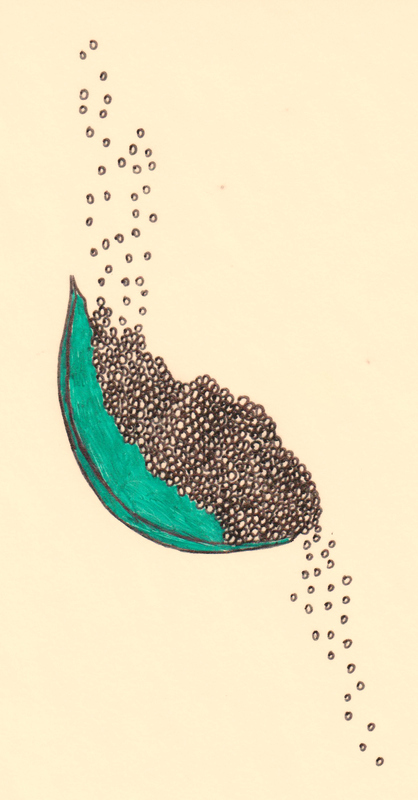 This is the last in a series of posts describing the projects that are part of our 2012 Spoonflower Staff Challenge. Voting begins tomorrow! Tim and I (Darci) dove into this project like crazy people. 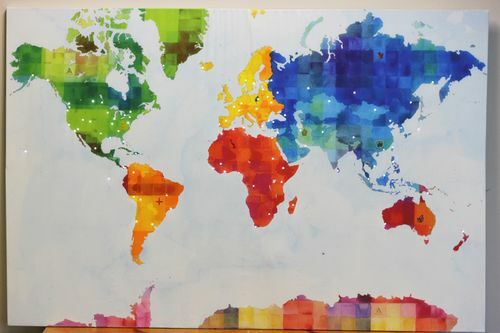 We definitely bit off more than we could chew, so it's fitting that for our Spoonflower Staff Challenge we chose to make…the entire world according to Spoonflower. 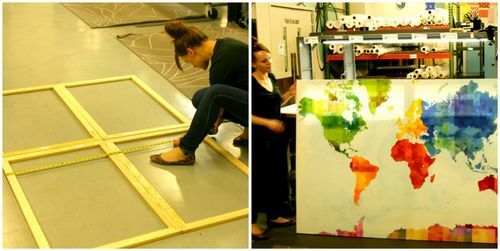 Our completed project is a fabric world map stretched over a frame with LEDs marking major world cities. A good soundtrack for this blog post would be all the hard rock that spurred us during many late nights as we feverishly toiled away. The soundtrack would be peppered with bursts of maniacal laughter erupting every time we looked up from our uber-meticulous task. More than once we questioned our sanity for embarking on such an ambitious project but now, gazing at our framed world map complete with sparkling LEDs marking some of the world's major cities, we think it was worth it. If you come visit us here at Spoonflower headquarters, we hope you'll agree. 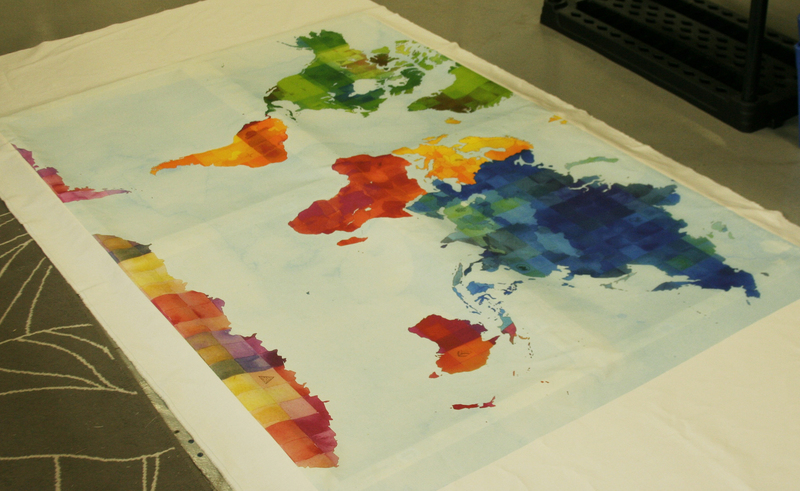 The Fabric Design: Tim created the simple and elegant textures for the world map. He filled the land portions with a tonal design that conjures land plots, and made the water pattern by scanning a piece of construction paper layered with a close-up of watercolor on paper. We added in a bit of extra fun (read: work) with some embroidery patterns on the fabric made from some of my sketched designs. Mary printed our design on my favorite Spoonflower base fabric, the linen/cotton canvas. 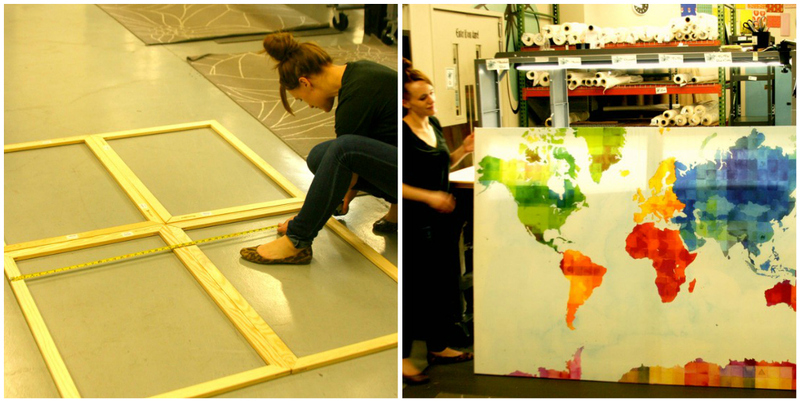 It's perfect for stretching artwork over a canvas frame. 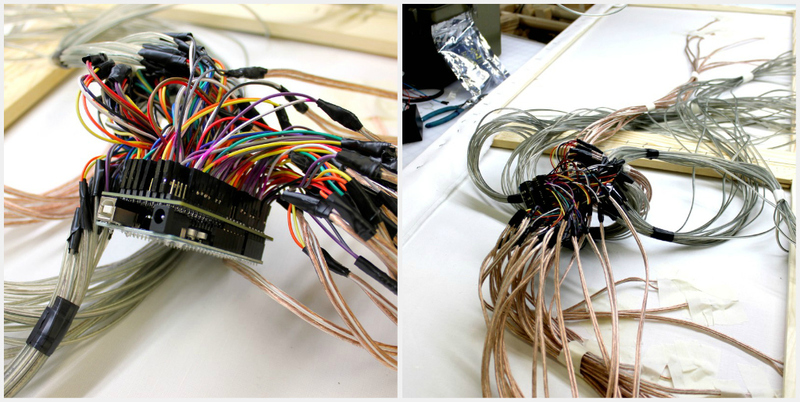 The Brains: Now for the guts of the project–wiring LEDs to the major world cities. I will give this over to Tim since, while I was a more than willing assistant to the main portion of the project, he was definitely the electronic wizard here. Tim: The foundation for the electronic portion of the project used an open source, do-it-yourself friendly, programmable controller called an Arduino. It allows you to plug into a computer and write custom code directly to the board. In our original vision, we wanted the LEDs on the map to link to the Spoonflower website so that when someone places an order, an LED closest to their geographical location lights up on the map. There are over 100 lights on the map, and they're each individually wired into the back of the Arduino unit which in turn is plugged via a USB cable into a computer. If you look at the back of the map, you can see how much wire this took–over 150 feet, I believe. Although it was a time consuming process, wiring the map in this way allowed for each light to be individually addressed for our purposes. Darci: I've never wired anything, so having the chance to assist Tim in the process was actually fun and informative for me. After many hours of wire stripping, cutting, LED poking (only sometimes poking ourselves), and even more soldering of all the bits from LED to connecting wiring to the Arduino unit, the map was complete. Almost. There was light, though! For now, the lights blink in a randomized order but in Phase II of this project, to be completed later, we will code the unit to light up the city nearest to a Spoonflower order. 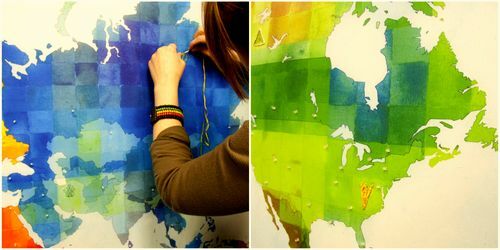 To ice the electronic fabric cake, I then embroidered our world map with beauty marks in contrasting thread. Click on the photo above for a short video of the lighted map. Thanks for reading and don't worry–no Tims or Darcis were harmed in the making of this lighted fabric world map. 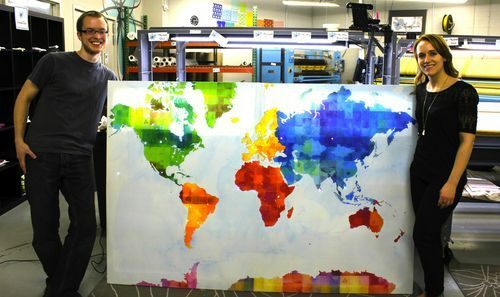 We have a new art piece that brightens up the space at Spoonflower HQ where we print, cut, and ship your fabric all over the globe.